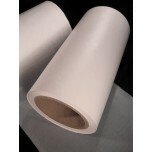 Home » Fuel Cell Components » Mylar Laminate (Self-Adhesive) - 9" x 10"
Mylar® is a DuPont® developed and manufactured oriented, multi-use, versatile polyester (PET) film. A few characteristics unitize this product line; Mylar does not become brittle with age under normal conditions because there are no plasticizers, it is archival quality, dimensionally stable, chemical resistant, color consistent, good clarity, non-yellowing, non-tearing, temperature range of -50 to 275F, electrically insulating, balanced tensile properties, and excellent moisture resistance (non-wettable). Use to protect the edges of your Membrane Electrode Assemblies (MEA) and to form a better seal within a fuel cell stack. The backing allows you to draw your template directly on the back before cutting it to shape. Once it is cut, simply peel and stick to each side of your MEA to provide a protective outer layer. Greatly reduces the tendency of the MEA to tear during disassembly. Mylar Laminate is best used in Polymer Electrolyte Membrane Fuel Cells (PEMFC), Direct Methanol Fuel Cells (DMFC), and Alkaline Fuel Cells (AFC).